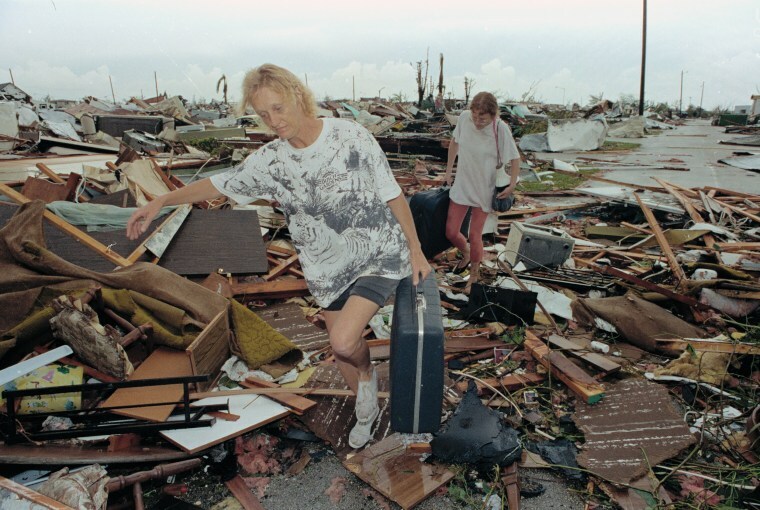 Twenty-five years ago, a monster storm called Hurricane Andrew focused its fury on a small south Florida city wedged between the Everglades and Biscayne Bay called Homestead — and nearly wiped it off the map. In the years that followed, the storm survivors were joined by thousands of new arrivals who turned the once-sleepy farm town into a sprawling Miami exurb and poured millions of tax dollars into revitalizing a moribund downtown that is now anchored by a shimmering new $26 million, 75-foot tall City Hall building. Now all that effort is being threatened once again by another hurricane, this one named Irma. Located some 35 miles south of Miami, Homestead sits in the southernmost section of the continental U.S., where the mainland gives way to the Florida Keys. And with the Category 5 hurricane forecast to slam into Florida as early as Friday, Porter said there has been a steady of stream of “Keys folk” heading north on U.S. 1 through Homestead for higher ground. Porter said they have spent the past few days making sure Homestead residents know where the shelters are and making sure the families of key city workers and police officers are in safe places. “We’re doing that because those workers are going to be working around the clock,” the mayor said. Homestead’s historic downtown sits on higher ground, but the east and west sides of the city are built on what used to be low-lying potato fields “and are more prone to flooding,” Porter said. “So we will be watching those neighborhoods closely,” said Porter, who will be working out of a command center in the new City Hall. Porter, 58, who was born and raised in this city of 65,000, said his house was destroyed by Andrew. So were the houses of his grandparents and other kin. And that, Porter said, is the only silver lining to Hurricane Harvey. “We’ve been looking at what’s been going on in Houston, so everybody’s got in their minds what Mother Nature can do,” he said. Bob and Meda Jensen decided not to stick around to find out. Natives of Iowa who have called Homestead home for 39 years, they too are Andrew survivors. But now they’re senior citizens with worried children who implored them to get out of Dodge. Bob Jensen, who is chairman of the Historic Homestead Town Hall Museum, said their home sustained of minor damage from Andrew. Estéfana Hernandez, whose El Toro Taco restaurant is one of the longtime anchors of Homestead’s revitalized downtown, began boarding the windows of her eatery on Wednesday and those of the other businesses her family owns on Krome Ave., the main drag in town. The plan for Irma is for Hernandez’s grown son Hector to “spend the night in the restaurant to make sure everything is okay,” she said. Is she willing to rebuild again if Irma does to Homestead what Andrew did?